December 31 is recognized as New Year’s Eve in any country that uses the Gregorian calendar. Although the calendar originated with the Catholic church, it is now used as a civil calendar by most nations even if Christianity is not the primary religion. Consequently, New Year’s Eve has become a secular date and one that is celebrated across Africa in much the same way that it’s celebrated in Europe or North America - with fireworks, parties and countdowns to midnight. In almost any major African city (and plenty of smaller ones), you will find New Year’s Eve parties and events on December 31. In some African countries (like Morocco, Algeria and Tunisia), people use the Gregorian calendar for official purposes but determine religious dates and years according to the Islamic calendar. Ethiopia does not use the Gregorian calendar at all, instead following the Ethiopian or Coptic calendar. These countries recognize a different New Year and December 31 celebrations sometimes pale in comparison. In this article, we look at how New Year’s Eve is celebrated in places with alternative calendars. We also take a look at some of the biggest African celebrations of the Gregorian New Year. Cape Town is a fantastic place to celebrate New Year’s Eve, with countless parties hosted all over the city. However, if you’re looking for a Times Square ball drop-style extravaganza, make your way to the V&A Waterfront. Every year, this scenic pedestrianized hub is home to the biggest New Year’s Eve celebration in South Africa, complete with a parade and a magnificent fireworks display. You can walk from one bar to the next, listening to live music and watching street performances along the way. Avoid driving under the influence by booking a room at a waterfront hotel like the Cape Grace or the Victoria & Alfred. Expect to pay premium prices and remember to make your reservation months in advance. In Nigeria, those in search of big-city glitz and glamor will find it in Lagos’ affluent Victoria Island neighborhood. Known for its expatriate community and abundance of trendy clubs and 5-star hotels, you’re spoiled for choice in terms of extravagant New Year’s Eve parties. In particular, Quilox nightclub and Radisson Blu Anchorage Hotel are known for their festivities. Kenya and Zimbabwe host two of the continent’s biggest New Year festivals. House, alternative and reggae music festival Kilifi New Year takes place in the coastal town of Kilifi, located in between Mombasa and Malindi. Lasting from December 30 to January 2, it’s held on a 20-acre plot of land beneath 1,000-year-old baobab trees and features DJ sets, live music, organic food and drink stalls and a water park. The burning of a giant sculpture welcomes in the new year and symbolizes new beginnings and the hope for a bright future. In Zimbabwe, the Vic Falls Carnival is a three-day festival featuring Africa’s biggest names in music. Expect firebreathers, traditional dancing and the Carnival Train, which takes you to a secret rave inside the Victoria Falls Wildlife Park. If raucous parties are not your scene, consider escaping the crowds with an al fresco celebration in one of Africa’s breathtaking nature areas. 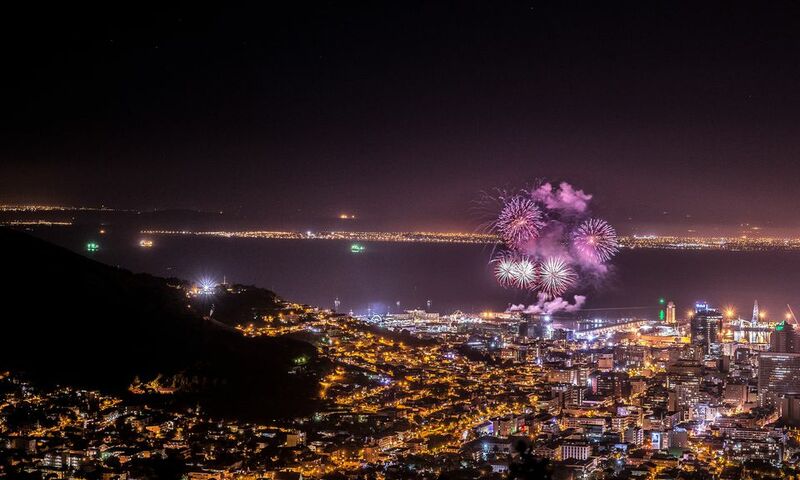 In the far south of the continent, adventurous revelers take a nighttime hike up Lion’s Head mountain to watch the V&A Waterfront fireworks from high above the city. The panoramic views of Cape Town’s lights disappearing into the inky blackness of Table Bay are guaranteed to kick your new year off to a memorable start. At the other end of Africa, Moroccan tour operators offer New Year’s excursions into the Sahara Desert. They usually take place over two or three days and involve a camel trek through breathtaking dunes, culminating in a celebration of traditional Berber music, food and dancing beneath the stars. Islamic countries across Africa use the Islamic calendar to determine religious festivals and periods of fasting. This includes the Islamic New Year, known as el-Hijra. El-Hijra is named after Prophet Muhammad’s journey from Mecca to Medina to find a place to practice his newly founded religion in peace. This migration took place at the beginning of Muharram, the first month of the Islamic lunar calendar. The date of the Islamic New Year is determined according to lunar cycles and changes every year in relation to the Gregorian calendar. It is a time of self-reflection for devout Muslims and many communities observe a period of fasting. Because most Islamic nations use the Gregorian calendar for official purposes, January 1 is a public holiday in many Mulism-majority countries (including Tunisia, Algeria, Morocco and Nigeria) and revelers will still be able to attend typical New Year’s Eve parties on December 31. Because alcohol is only served in non-Muslim establishments, big hotels like the Sheraton Tunis Hotel in Tunis and the Fairmont Royal Palm in Marrakesh are your best bet for a Western-style shindig complete with live entertainment and fireworks. Ethiopia exclusively uses the Coptic calendar, which celebrates the first day of the new year on September 11 (except for years preceding a Gregorian leap year, when it falls on September 12). The Coptic New Year celebration is known as Enkutatash and lasts for three days during which Ethiopians take part in church services, singing, processions and feasting. On their version of New Year’s Eve, families traditionally burn torches of dry wood in front of their houses and usher in the new year with hymns. If you're in Addis Ababa, Kiddus Raguel Church is known for its colorful Enkutatash services; but the most spectacular celebrations take place in the city of Gondar. Although September 11 is celebrated as a public holiday in Ethiopia instead of January 1, big hotels in major cities like Addis will still host conventional New Year’s Eve parties on December 31. Egypt uses the Gregorian calendar as its civil calendar, and the majority of its population follow the Islamic calendar for religious purposes. However, Coptic Christians also celebrate the first day of their new year on September 11 with a feast called Nayrouz. Coincidentally, Islamic New Year also fell on September 11 in 2018.